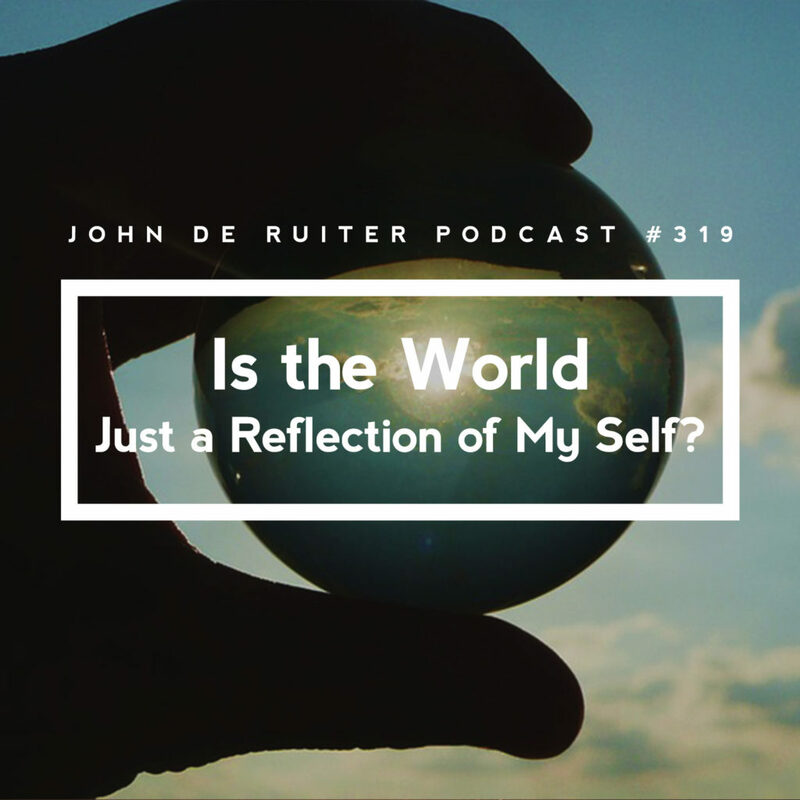 JdR Podcast 319 - Is the World Just a Reflection of My Self? Is the World Just a Reflection of My Self? This man has been told that the world is a reflection of himself and doesn’t know how to deal with the rejection and unfriendliness he feels. John shows him what really matters and how he can heal himself and become a reflection of his own heart in the midst of this world and all his troubles. "As soon as you are different within, there’s a tiny touch of this world that’s different. Then this world isn’t a reflection of your self. Then you, in your heart and eventually your self, are a reflection of what this world is able to be." Q: I find it hard to deal with getting upset by what happens in the world, and we were told that the world is a reflection of my self. Is that correct, and how can I understand that this world is so unfriendly to me, towards my self? Who is doing this? Who is responsible? John: In some way everyone, but at first you don’t need to take care of anything other than just the space within. This world you’re in, but it isn’t yours. It isn’t for you to carry. Instead of you concluding what is a reflection of your self within those things outside of your self, you can be a reflection of your warmed heart within. You can be a reflection of that in your self. You can be a subtle reflection of your warmed, opened heart in the midst of your thinking instead of you using your thinking to conclude what it is outside of your self that is a reflection of your self. It doesn’t matter so much what this world is like and what your self is like. What does really matter is what you are like in the midst of this self you have. What really matters is not so much your self, its conditioning, its past, all of its belief structures. What really matters is what you, awareness, are being in your self. It matters whether you are being closed and hard in your self or whether you are opening and softening in your heart, and remaining that way in the midst of what self you have. You’re able to reflect differently in your self instead of you judging what it is in this world that is a reflection of your self. Q: Why is there so much reflection coming my way? Is there a reason for that? John: It’s all there for you to be this (John opens his hand): just openness and softness of heart in the midst of that. It matters that you are opening and softening in your heart. That’s what lets your heart come into your self. Your self doesn’t matter very much. What you are being in your heart, openness and softness of heart, really matters. John: Yes. That makes you a reflection of your being in your self. It doesn’t matter what your self is like. It matters what you are like, in your self: softness of heart in the midst of hardness in your self, openness of heart in the midst of what is closed in your self. It’s what you are being in the midst of your self – this openness and softness of heart – that cleans your self and heals your self. It doesn’t matter what your self is like. It matters what you are like, and that you are being that in the kind of self you have: you being openness and softness of heart that bears no judgment of your self, that you’re not painting your self all of the different things that you feel in your self, that you’re not painting all of your thoughts and feelings about your self on your self. Q: What you’re saying isn’t really clear to me. Would you say it differently? John: Instead of using what you think in your self, instead of using your thoughts and your feelings of your self to define your self, that you just be openness and softness of heart in the midst of your self. Q: It’s really a strong pattern to do it differently but I know what your advice is. Still, it’s hard to do it continuously. John: You can be gentled in your heart in the midst of those things that are disquieting in your self. You can be gentled in your heart in the midst of everything that provokes negative thinking and feeling. It’s a little bit like you taking a hot shower in the midst of a troubled house. You don’t need to fix the troubles. You can let the hot shower over your body wash away how you hold all of those troubles. As you let that in, you realize deeper levels within, levels in you that don’t relate to those troubles. What that opens up is a whole different way of being in the midst of your troubles. You let this form your life in your heart. That forms your life in your self, and that forms your life in this world – a deep, inner heart life in this world. All that changes in that is you: not this world, not your self, just what you are being, and that having form all in your heart, then in your self and then in this world. That is a tiny, tiny change in this world. As soon as you are different within, there’s a tiny touch of this world that’s different. Then this world isn’t a reflection of your self. Then you, in your heart and eventually your self, are a reflection of what this world is able to be.